Meals by Wheels is an event catering company to assist you and make everything easy for you. We cater weddings, house warmings, large or small parties, boardroom luncheons, corporate events, gallery events, press conferences, seminars, private dinners, product launches, school & home events, etc. Chaluth’s kitchen creates every dish by our Royal Palace cuisine skill chef with 4 years guaranteed “Best Restaurant Guide” from Singapore. Furthermore, Meals by Wheels also provides flower arrangements to suit the event at the reasonable price. Petai Seed Restaurant… lucky Chalong residents now have some of the best food available in Phuket right on their doorstep. Royal Thai cuisine, often promised, rarely delivered in our local restaurants, is now available from the authentic hands of Chef Chaluth Cheepsatayakorn. The restaurant is a simple, rustic roadside building with indoor and outdoor dining. In the morning his cooks produce breakfast and lunch of basic dishes, well cooked and at low price. 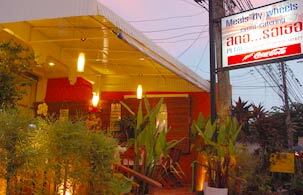 In the evening the Royal Thai cuisine appears, still at sensible prices. The capacity is limited, so try to book ahead to reserve a table, and let Chaluth recommend dishes to produce a balanced feast of flavours and sights. Petai Seed Restaurant, (Sator Rawthur) is at 29 Chao Fa East, Chalong, very near the wine Connection, but diagonally across the road. His mother was trained in the Royal Palace, Bangkok, and cooked for the King for 17 years, until she left to get married. She began teaching Chaluth when he was 6, and in the last three decades he has perfected the skills she taught him. You will find items on his menu which are rarely seen outside the Palace. The care in selecting ingredients, preparation and cooking is immediately obvious.